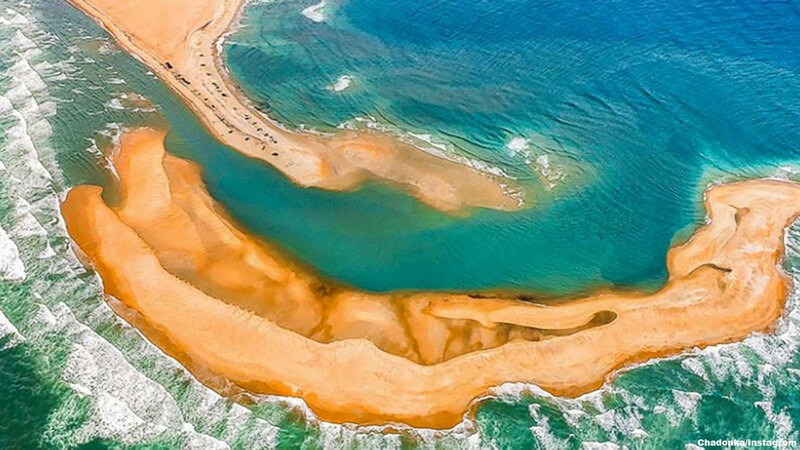 A new island has appeared off our coast and it is exciting local water-loving North Carolinians and tourists alike! It's being called Shelly Island. And because of the changing tides of the Atlantic Ocean, beach goers at Cape Hatteras' Cape Point can now trek to the newly formed land. "It's a dynamic area. Because of the two different currents -- the Gulf Stream and the Labrador Current -- the sand is always shifting and moving," Mark Dowdle, the deputy superintendent of the Cape Hatteras National Seashore, which oversees the island, told ABC News. "A large sandbar has formed off the tip of Cape Point and essentially created a new island," he added. "It could continue to grow or soon it could be completely gone. We don't know." According to Dowdle, those visiting the North Carolina coast are enjoying the new - mile long and several hundred yards wide - island. Bill Smith, the president of the North Carolina Beach Buggy Association, told ABC News it's a great place to get sea shells, and historically, the area has been a good place to fish too. However, Smith warns that because of that, it's probably not best to walk over to the island at low tide when the water may appear shallow. The local park service has also issued several warnings for those trying to enjoy long summer days on the new island. "If someone were to go out there, use the buddy system. Do not go alone," Dowdle told ABC News, noting that the water is particularly rough near the island due to strong currents and riptides. He advises using flotation devices such as paddle boards or surfboards along with a life jacket if you attempt to swim out there. Dowdle also said there could be various "marine life," such as jellyfish. "There could be other marine life too and because the water's agitated from the waves, you can't always see," he told ABC News.